Maria Piggin and Sophie Wintrich hold voluntary positions as European Patient Advocacy Groups (ePAGs) in the European Reference Network (ERN) on Rare Hematological Diseases (EuroBloodNet). Maria is the Chair of PNH Support and Sophie is the CEO of MDS UK, which are both based in London and support rare disease communities in the UK. EuroBloodNet covers both oncological and non-oncological rare haematology diseases in adults and is a network of 66 healthcare providers across 15 European Union (EU) Member States. Along with Maria and Sophie, there are five other ePAGS in EuroBloodNet based in various European countries representing various haematology diseases. The UK is set to leave the EU and as it currently stands, the UK Government and the EU have not agreed on a future relationship that protects the UK’s ability to continue to be involved in ERNs. Without the continued involvement of the UK, both rare disease patients in the UK and across Europe will suffer. 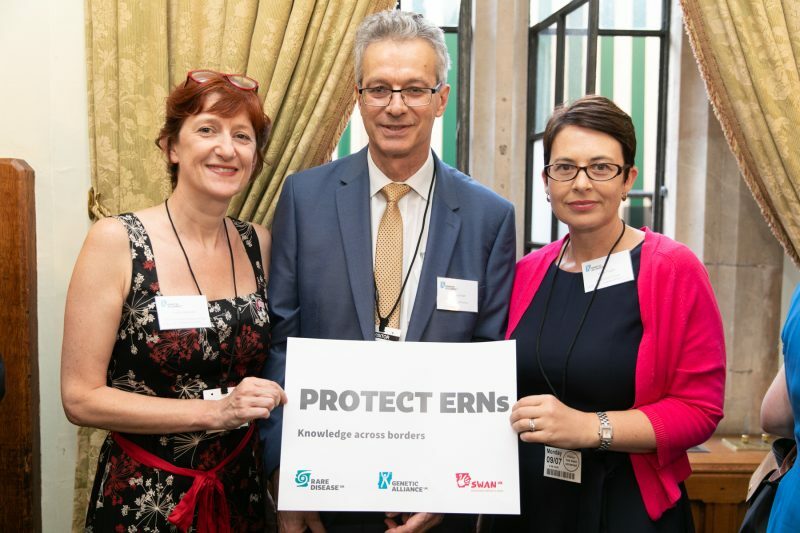 We have set out below four examples of ways that rare disease communities in the UK stand to lose if the UK is prevented from continuing to collaborate in ERNs. European Reference Networks provide infrastructure for consultations with experts to be held online or over the phone. EuroBloodNet uses a dedicated and secure IT platform to enable doctors (with patient consent) to obtain a second opinion from an expert with the appropriate expertise, by sharing pseudonymised clinical data and medical images via a virtual consultation. Therefore the expertise travels rather than the patient, saving patients the expense and stress of travelling to the expert(s). This model is a highly efficient way for clinicians to seek second opinions and from which rare disease communities in the UK could benefit. In the future, ERNs will go further, a patient referral system is planned for patients and their samples based on identified cross border patient pathways to ensure consistent access to healthcare across Europe. Also, a European inventory of experts and available medical facilities has been created to identify gaps which will facilitate a strategic approach to addressing unmet need. Limitations in knowledge of rare haematological diseases contributes to a patient’s ‘diagnostic odyssey’ (ie the time it can take to diagnose a rare condition). Patients can spend months or years bouncing between specialists, with their odyssey only ending when they are referred to a healthcare professional with the necessary skills, technology or experience to diagnose the condition. As well as delays, there are also a number of patients who can receive one or more misdiagnoses. A lack of information and decision-making support for the best treatment options cause delays following a diagnosis too. – information on treatment ‘variations’ where, due to circumstances or clinical judgment, different actions or conclusions are taken. – actions which will most frequently represent ‘best practice’ for most patients. A pathway will include prompts for certain actions to be undertaken at the appropriate time to determine if they have been carried out, and if results have been as expected. This type of analysis is only possible when there is a sufficiently large amount of combined data from rare disease patients across many countries. Limitations in knowledge of rare haematological diseases and information regarding health services for them contributes to a patient’s ‘diagnostic odyssey’ (ie the time it can take to diagnose a rare condition) as well as the number of patients who are misdiagnosed. There is currently also a lack of decision-making support for best treatment options. – map diagnostic methods, demography, survival rate, clinical features and treatments in order to improve access to specialised healthcare and facilitate research and development of new treatments. The RADeep platform is being implemented in phases through disease specific arms beginning with pyruvate kinase deficiency (PKD) called PKDeep. Due to the fact that SCD groups at a national level are at very different stages of maturity from one country to another, EuroBloodNet intends to facilitate the creation of a European umbrella network of national SCD patient organisations (in collaboration with the European Organisation for Rare Diseases — EURORDIS). It is hoped that this will allow the development of a strategic alliance to address SCD patients’ needs. This network will fulfil key roles such as: helping patients and their carers understand the best patient pathways and implementing the report on rare disease policies to make sure all health policy and research delivers to patients’ needs and priorities. These are only four of many reasons why it is so important that the UK continues to take part in ERNs. Ultimately rare disease communities benefit from collaboration with larger networks in order to be seen and to have a voice. Please help us fight to have that voice.